Egg labels can be confusing or even misleading. The following guide is designed to help health conscious, humane shoppers decipher egg labels. 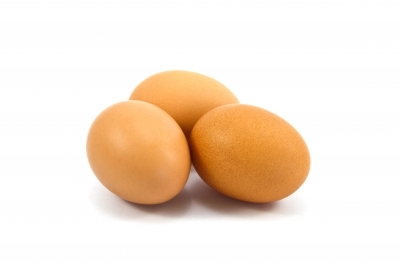 Eggs are white or brown depending on the type of hens that lay them. Their nutritional value is similar. Most eggs come from hens that live out their lives in battery cages where they suffer cramped, unsanitary conditions and extremely poor health. Each hen is allotted a space smaller than a single sheet of paper and must stand on a sloped wire floor that causes discomfort and often serious injury. Unsurprisingly, battery cage eggs are not as nutritious as free-range eggs. Approximately 98% of all eggs purchased in Canada come from battery cage hens, and labels such as “Farm Fresh” and “All Natural” can be misleading, as they indicate nothing regarding animal welfare, what the animals are fed, or how nutritious the eggs are likely to be. Omega-3 enhanced (or omega-3 fortified) eggs come from hens given feed that contains significant amounts of flaxseed, which is high in omega-3 fatty acids. Most omega-3 enhanced egg layers live out their lives in battery cages. Many people buy free-run eggs believing that the chickens that lay them have access to outdoor pasture, but the reality is that these chickens usually live inside dark sheds. They are free to roam around within the enclosed space and to stretch and spread their wings, which is a significant improvement over battery cage conditions, but they don’t have access to outdoor pasture. As with battery cage farming, forced molting (starving hens to produce more eggs) and beak trimming (removal of a portion of the beak, usually with a heated blade) are common practices. Cage-free eggs may be from free-run (indoors only) or free-range hens (hens with access to outdoor space). Free-run/cage-free egg producers are not audited by third-party inspectors. Free-range egg layers are also housed in sheds with slotted floors or litter, but in addition to roaming freely within their sheds, they have access to outdoor areas with vegetation when weather permits and thus live a far more natural lifestyle. They are often (though not always) provided with nest boxes in which to lay their eggs. Forced molting and beak trimming are permitted. True free-range eggs are more nutritious than those obtained from battery cages. However, free-range producers are not audited by third parties unless the eggs are also certified organic. The similar label “Pasture Raised” is also unregulated. In addition, it should be noted that the “Pasteurized” label, sometimes mistaken for a free-range indication, actually means that eggs have been treated to eliminate salmonella bacteria so that they may be eaten raw. Certified organic eggs come from hens that have access to outdoor areas with vegetation and are fed an organic diet, though forced molting and beak trimming are allowed. The conditions in which certified organic eggs are laid are verified by third parties, which reduces the likelihood of fraudulent labelling. The conditions in which BC SPCA Certified eggs are produced are verified by third parties. Animal Welfare Approved hens live in cage-free environments with access to outdoor pasture. They are able to move freely, socialize, and engage in natural, health-promoting behaviours. Beak trimming and forced molting are prohibited. The Humane Farm Animal Care Program demands humane treatment of farm animals from birth to death. Certified Humane hens have sufficient space to move around and stretch their wings, as well as proper shelter and enough food and water to be healthy. In addition, they are provided with perches, provisions for dust bathing, and good air quality, though they may not have outdoor access. Forced molting is prohibited, but beak trimming is allowed. American Humane Certified hens are indoors-only but cage-free, with sufficient space to perform natural behaviours. Forced molting is prohibited and beak trimming is allowed only in certain cases. This label indicates only that hens receive food and fresh water. Hens can be kept in battery cages and beak trimming is allowed. This label, provided by the Royal Society for the Prevention of Cruelty to Animals (RSPCA) of England and Wales, requires that farms adhere to strict animal welfare standards throughout an animal’s life cycle, including during transportation. Both yearly and random checks are undertaken to ensure that standards are met. Beak trimming is allowed, but forced molting is prohibited. For more food articles, see the main Food and Nutrition page. BC Egg Marketing Board. (2008). “FAQs.” BCEggs.com. Canadian Coalition for Farm Animals. (2009). “Cage-Free Eggs: A Comparison of Labels.” HumaneFood.ca. Eng, M. (30 December 2009). “USDA Guide of Definitions Helps Crack the Mystery Surrounding Egg Labels.” Vindy.com. The Humane Society of the United States. (1 September 2009). “Cage-Free vs. “Battery-Cage Eggs.” HumaneSociety.org. Vancouver Humane Society. (n.d.). “Misleading Egg Labels” and “Recommended Labels.” ChickenOut.ca.